Years ago, when I was a teenager, I was over at my friends house when the power went out. We had been making some special potato dish for her dinner. I remember that her grandparents were coming over and her grandpa was a picky eater so we had to make sure all the potatoes were pealed perfectly. Anyhow, as we were preparing this dish the power went out. We continued as much as we could in the dimly lit area and then talked and did some other things while we waited. But that potato dish had to be in the oven by a certain time so it continued in the back of our minds as we did the other things. What seemed like hours later (but was probably not even an hour) my friend commented about how we needed power soon and the loudly proclaimed "And then there was light!" That very second the lights came on! It was so awesome - we were stunned and had a great laugh over it. Every time I hear those words, I still think of that story. I wish it would have been as easy as proclaiming some words this time around. We had the electricians here doing lots of work over the course of 4 days last week. It was noisy, dusty and dirty - but the results were exactly what we hoped for! 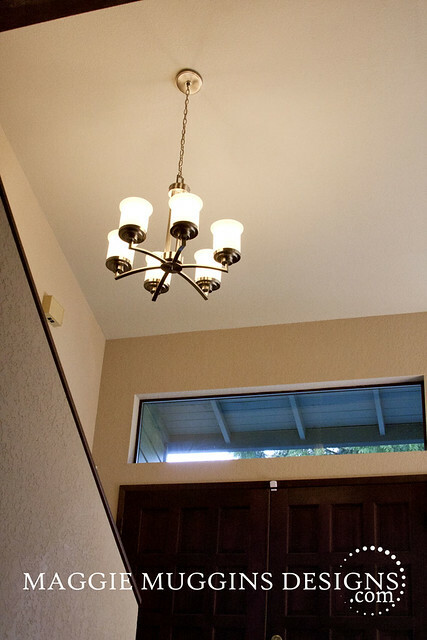 One of the first things they did was replace the entry-way chandelier for us. I asked you for suggestions recently - and showed you our top choices. In the end - we didn't go with any of them. The first reason is we decided two-tier might be too wide of a chandelier for the space. The chandelier hangs right at the bottom of the stairs so the old light actually made my husband feel like he was going to hit his head on it. We needed to be really careful what we replaced it with so we chose a one-tier version of one of our favorites. It also needed to hold about 5 regular bulbs to provide extra light to the adjacent room - which had no lights at all. Another factor that influenced our decision was the entire collection. 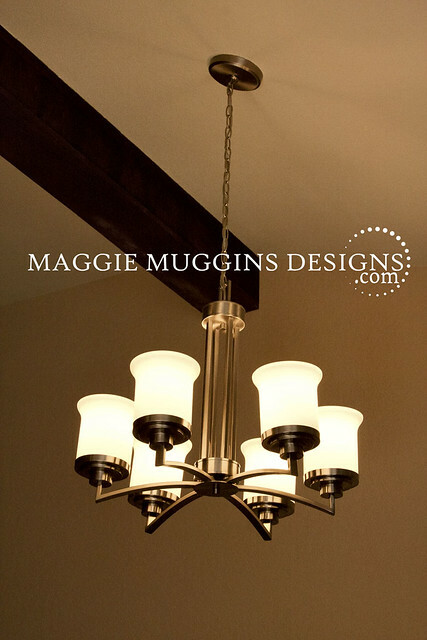 Many light fixtures come in a coordinating collection with chandeliers, flush mount, semi-flush mount, pendants and wall lights all made to match. We're replacing a lot of the other light fixtures in the house so we wanted to be able to use some from the same collection. Some of our top choices we ONLY liked the chandelier in the collection and nothing else. Lastly we chose based on style. We wanted a modern style but something that was still elegant. If the price hadn't been so much higher than the rest ($400 more) my husband would have picked #7 from our top choices. The prices were so much better on the rest of the styles though. Also - we found the lights on LightingDirect.com but purchased them cheaper on Amazon.com . I have to confess, even after it arrived, even after choosing it, I was still nervous until I saw it hung and lit up. What a HUGE difference it made. The space is so much brighter and the room next to it didn't need the lamps anymore. I'll be back soon to show you some of the other lighting/electrical work we had done.